Style and comfort merge in the Art Nouveau center of Palermo Joli! 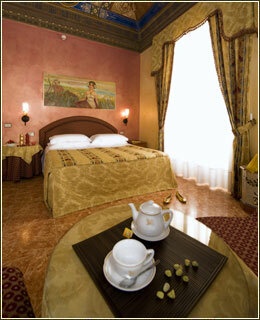 The Palermo Hotel Joli, is the ideal starting point on your adventure in Sicilian culture and art. The best hospitality, amenities and services offered by a hotel in Palermo. Ideal for families or business travelers, the Hotel Joli in Palermo provides information on tours and transportation. In line with is central location in Palermo, the Hotel Joli offers fax service, ADSL internet connections and parking - essential for business trips to Palermo. Hotel Joli: what else in Palermo? All you have to do is pick the Hotel Joli in Palermo. The Hotel Joli will pamper you with services, amenities and hospitality you won't find at any other 3-star hotel in Palermo. There's more to the 3 stars at the Hotel Joli in Palermo: you'll be in Sicily, cradle of ancient history, culinary bounty and extraordinary natural beauty. The best of the Mediterranean is at your feet at the Hotel Joli in Palermo. Enter the Hotel Joli in Palermo, pamper yourself!